Holly Lake | Northern Wilderness Outfitters Ltd. This lake is located about 150-160 miles north of our airbase and it takes a little over one hour flying time to get there. Holly lake has a lot of bottom structure with many gravel reefs, sandbars, and rock piles for spawning grounds. 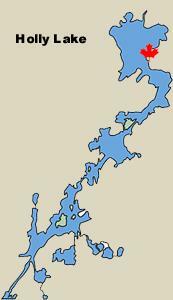 This makes for ideal and highly productive lakes for 2-3 pound and larger walleyes and large northern pike. With all the area you have to fish and explore, you can always find a secluded area with lots of fishing action. We have the only outpost cabin on this lake. The cabin can accommodate parties of up to ten fishermen and are nestled among some giant pine trees. 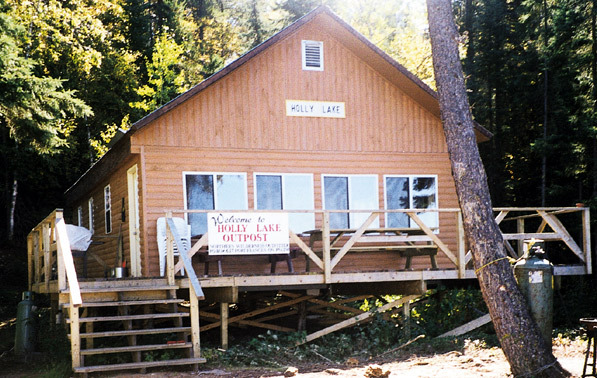 The cabins have running water, hot showers, separate bedrooms for fishermen who want to bring their wives on such a trip, a sitting area with sofas and chairs, gas refrigerator/freezer, large gas barbecue grills, 6” mattresses on the bunks, boats with swivel padded boat seats, Yamaha outboard motors, and other amenities to make your trip more comfortable. The large deck areas have also been built on these cabins. If your party is looking for comfortable accommodations, great walleye and northern pike fishing, and being the only cabin on the lake, choose one of these for a successful fly-in vacation in the Canadian Wilderness. Party of 4-5 $1295 ea. U.S.
Party of 6 or more $1195 ea. U.S.